There are plenty of boat shows this Father's Day weekend! The next best thing to being on a boat is just being around boats, and there's no better place to do that than a boat show - especially if the weather doesn't cooperate. And the good news is there are plenty of nautical events around the world this weekend. 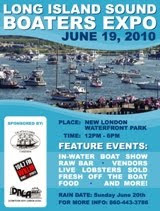 For our local friends, be sure to check out an all new one-day boating event in New London this Saturday. The Long Island Sound Boaters Expo is the perfect place to bring dad on his special weekend, but the event is only from Noon to 6 p.m. (More info.) Vendors like BoatNameGear will be on display with last minute Father's Day gifts. Soundings Magazine told us that Florida has announced another free fishing weekend - meaning no fishing license is required - to encourage people to get out and catch saltwater fish along Florida's coastline over Father's Day weekend. Lake Tahoe Concours d'Elegance calls itself North America's premier wooden boat show. Dad will certainly enjoy the vintage vessels at this event. If you're into newer boats, then visit Fairplex in Pomona, where the Spring Boat Show is happening all weekend. If CT and CA are too far for you, bring Dad to the Bay Harbor In-Water Boat Show in Michigan, featuring vessels of all sizes from personal water craft to mega yachts up to 95 feet. Those of you in the UK can enjoy the South Wales Boat Show in Swansea, where you'll have a chance to meet Peppa Pig on Saturday and Sunday. We don't know who Peppa Pig is, but your kids probably do. If you need more info about any of this weekend's events, visit our boat show calendar. Unfortunately, there won't be a boat show this Father's Day weekend in my area. But I'll be on the water nonetheless. Can't imagine a better way to spend the day than on the water with my family.